Stepping onto the eighth floor of WeWork at Two Embarcadero center on Wednesday night is like walking into the office party of my dreams. Gone are the too-tipsy co-workers, stale, plastic chip bowls or tiny, watery cups of wine. They are replaced, instead, by un-intimidating clusters of stylish, post-work thirty-somethings who all clearly do pilates, cute couches punctured with plants, and an open bar to top it all off. This, apparently, is The Future of Food. So far I’m a fan. Hosted by WeWork and powered by sf.citi, The Future of Food is an affiliate event of the Global Climate Action Summit. It is unsurprising that sf.citi, an organization that not only facilitates conversation between the tech sector and city policymakers, but is widely known for its engaging, collaborative live events, is behind this gathering. Both the attendees and panelists represented a wide variety of sectors—ranging from food innovators, policy professionals, tech entrepreneurs and curious bloggers. The conversation not only reflected this diversity in perspective, but revealed a powerful truth—that food innovation is the future of sustainability, and technology is going to get us there. Walking further into the space I only become more inspired. My 12:01pm desk salad seems very (very) far away as I am met with the smell of the Impossible Foods Burger Bar and the welcoming smiles of my fellow early birds. The framed, strategically placed menu reads open faced mini truffle burger, classic picadillo empanada, lasagna muffins, brisket arancini. I try to contain my excitement as I double check with the helpful attendant– unnecessarily–everything is vegan. Downstairs, the much-anticipated Meatless Marketplace beckons. As I descend the blonde wood staircase I snap a sneaky picture of the crowd below and congratulate myself on successfully infiltrating an event where everyone is officially cooler than me. The open, yet intimate lower level of the Future of Food Event feels like my cool older cousin’s rehearsal dinner meets posh networking event. As the glass rooms become increasingly congested with a wide range of guests all trying not to look too desperately at the vendors’ spreads, I make the rounds. Alpha Foods, Fora Foods, JUST, NUMU, Ocean Hugger Foods, and Om Sabor all offer mouth-watering, bigger-than-costco sized samples with zero “I’m-just-grabbing-a-second-one-for-my-friend-really-fast” judgment (thank you). And I must say, my personal favorites are a undeniable combination of my profoundly sophisticated palate and deep midwestern roots. While the buffalo and basil pizza from NYC based restaurant NUMU and the potato empanadas from catering powerhouse Om Sabor were both crucial contenders, nothing (not even the edible, birthday cake cookie dough from Just) could beat Alpha Foods microwavable burritos. Cured-tomato sushi alternative? Cashew creme and cucumber ceviche? No thanks, hit me with a steak and cheese breakfast burrito, please. (I just moved here from Ohio, can you tell?). All jokes aside, if you ever needed proof that veganism is not just some stuck up, elitist, bay-area fad– this line of burritos is it. I grab a few more burrito bites “for my hungry friends upstairs” on my way up to the panel discussion– why we’re all here in the first place, right?– and snag a seat next to a woman I met earlier in the elevator. She smiles and gives me a thumbs up– “the philly cheesesteak is my favorite”. Phew, I’m not alone! Through my relief, I try to decipher, yet again, whether it’s the open bar or energy of the space that is making everyone so amazingly friendly. I chalk it up to the lasagna muffins. As I settle in for what turns out to be an incredibly animated and well informed panel discussion, I ponder– why is this such a Big Deal? Why does an open faced faux-meat burger with truffle veganaise, creamy “brie” and a chive crusted bun (yum) feel like such a huge moment for me– besides my obvious state of post-work starvation? Why do I feel like I’m in this strange, parallel world of of friendly faces and fabulous, sustainable food? 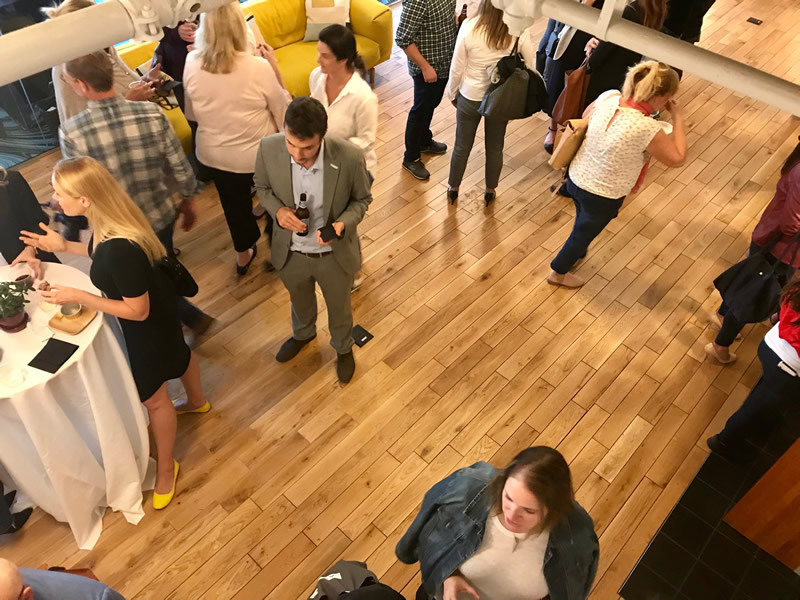 Is this really the future– or is it some kind of elitist utopia created– and attended– by white, Everlane-wearing one-percenters? After sixty-two minutes of considered conversation about ethics, technology, and individual culpability, I think I’ve figured it out. 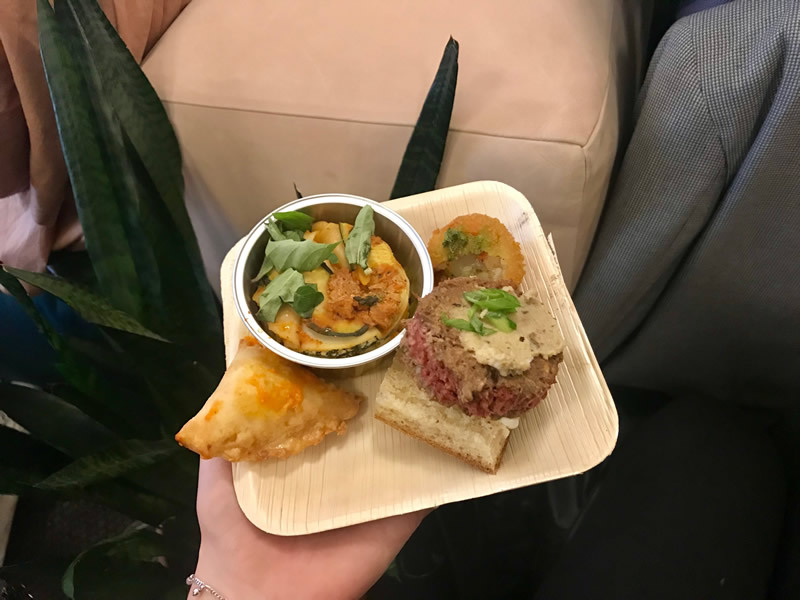 It isn’t the swanky decor, hotel suite view or perfectly presented snacks that make The Future of Food event, hosted by sf.citi and WeWork, so special. The tone isn’t patronizing, it’s hopeful– and the discussion isn’t pomopus, it’s informed. This event is– as panelist and CEO of Just, Josh Tetrick said– about so much more than food. It’s about the emotional connection we all have to food, family and culture. “Eating well should be a basic right”. Josh Tetrick’s statement is something we all recognize on a basic level, yet often fail to illustrate through our everyday decisions. The collaborative spirit of The Future of Food event, however, shows how tangible change is possible. The combination of policy makers, tech leaders, venture capitalists and everyday citizens that sf.citi is bringing together at The Future of Food is both rare and powerful. As Lindsay Baker, Vice President of Sustainability and Wellbeing at WeWork said, “Part of the spirit of saying we’re not going to eat meat anymore is resetting a default”. In order to truly reset that default, create positive change, and essentially transform the way we show up in the world, we need a diversity of leaders to be on board. Thanks to sf.citi, they’re all in one place. Now, the trick is to keep the conversation going. In order to maintain the momentum that the plant-based movement is currently accumulating is exactly sf.citi’s mission—inclusion and collaboration. What the panelists of this incredible sf.citi and WeWork event are talking about is, at its core, an equity issue. Bringing greater awareness to the benefits of a plant-based diet means making food—real, fresh food food that has positive implications for both its consumer and provider—accessible to everyone. And the key to that? Making everyone feel like they belong. That’s the Future of Food. (Oh, and microwavable breakfast burritos). Marie Concilus is a writer, designer and occasional yogi working in the Bay Area. She is a contributing author on numerous travel blogs and can usually be found overstaying her welcome at a local coffee shop. Check out her website here or send her an email at marieconcilus@gmail.com.